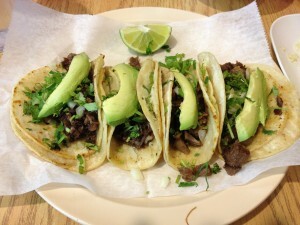 That said, people have been raving Taqueria el Amigo enough to pique my interest. It’s a tiny space that seats 16. The restaurant was half full when I arrived at 6pm on Friday night. I snagged a small table in the middle of the room. The menu is what you expect it to be: tacos, burritos, enchiladas and combo plates. I did notice they serve menudo (tripe stew) on weekends. The Tacos Especiales plate ($5.5) is four small tacos; you can pick between steak, chicken, pork carnitas, veggie, tongue, and beef cheek. I got 2 tongue and 2 cheek and I also got a side of guacamole ($2.5) and a side of rice ($1.5). The guac was excellent; perfectly seasoned and chucky with tomato and onion. It’s a very generous portion for the price. The rice was plain, but well cooked and exactly what I wanted it to be. The tacos were supremely delicious! The cheek was meltingly tender and the tongue had a perfectly springy texture and chew. They were topped with onion, cilantro and a perfect slice of avocado. I loved them. I will be back again and again, as they are only a few blocks away from Russo’s, my favorite market. I want to try the steak, the carnitas and all the other dishes people have been raving about.